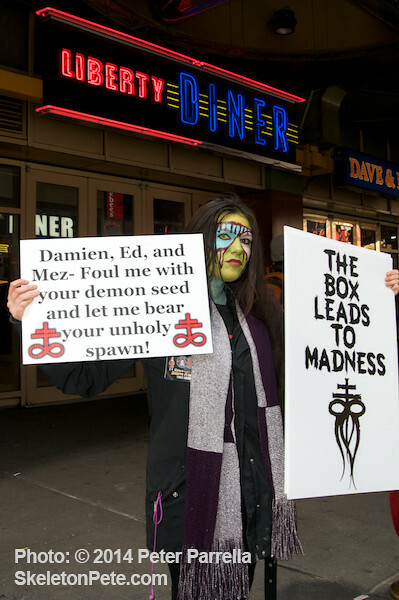 « Season 10 Buffy & Angel Variant Exclusives from Dark Horse at WonderCon – This Weekend Only – April 18-20! 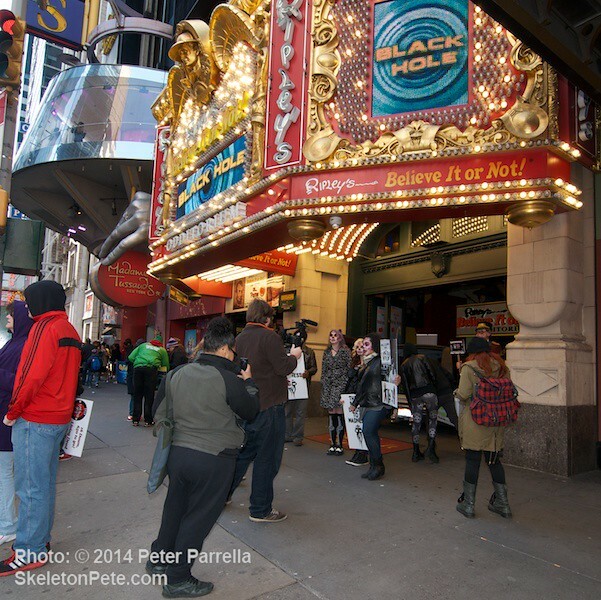 The lingering ghost of winter touched one more frosty finger on NYC the morning of April 16th, 2014 but that didn’t stop Mezco Toyz devotees from beginning to cue up near Ripley’s Believe It Or Not Times Square Odditorium at the crack of dawn, or was it crack of doom? 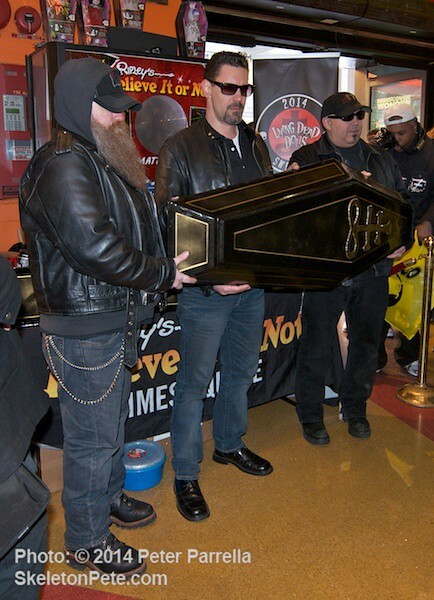 The shivering flock was there to insure a gander at Mezco’s Living Dead Doll “Time Capsule” and its contents before the toy company finds a long term resting place for it. 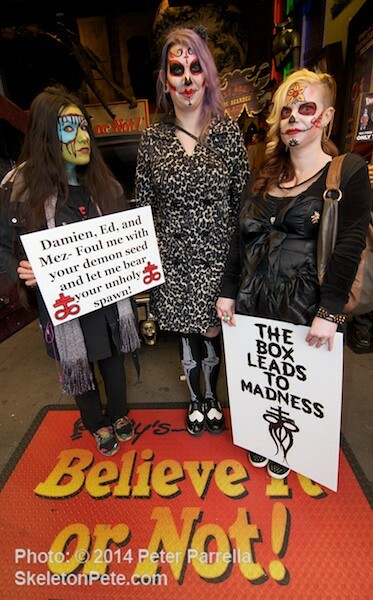 The first 160 early bird fans were rewarded with limited edition LDD coins placed into their cold and clammy claws and a discount to view the fascinating curiosities that line the corridors of the Odditorium. 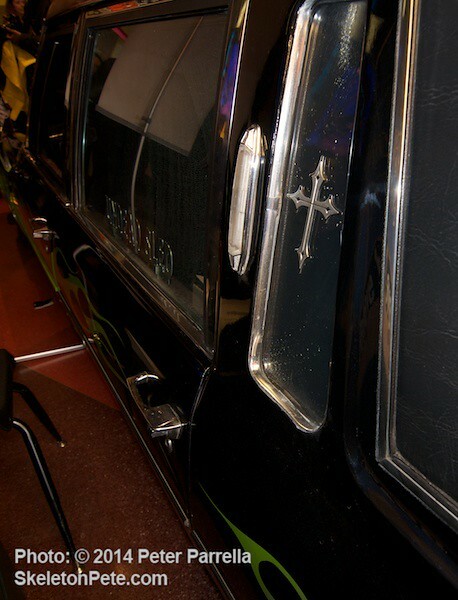 Sweet Sixteen, and Never Been Bitten? 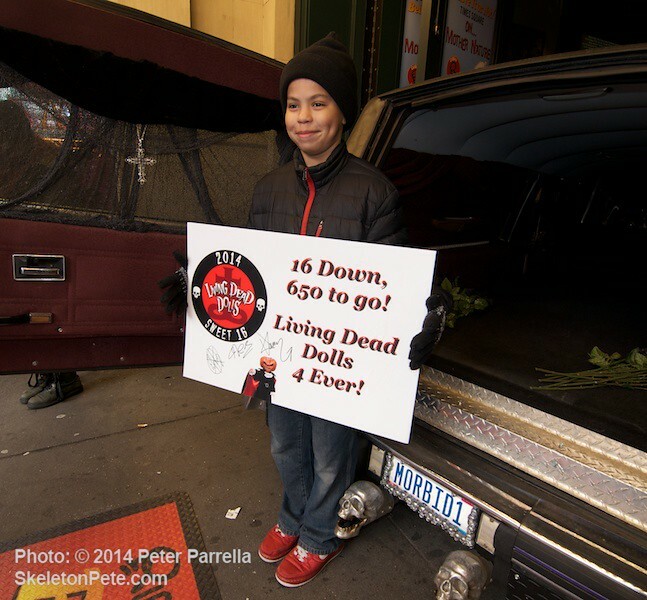 The coffin shaped encasement commemorates 16 years of Living Dead Doll production. 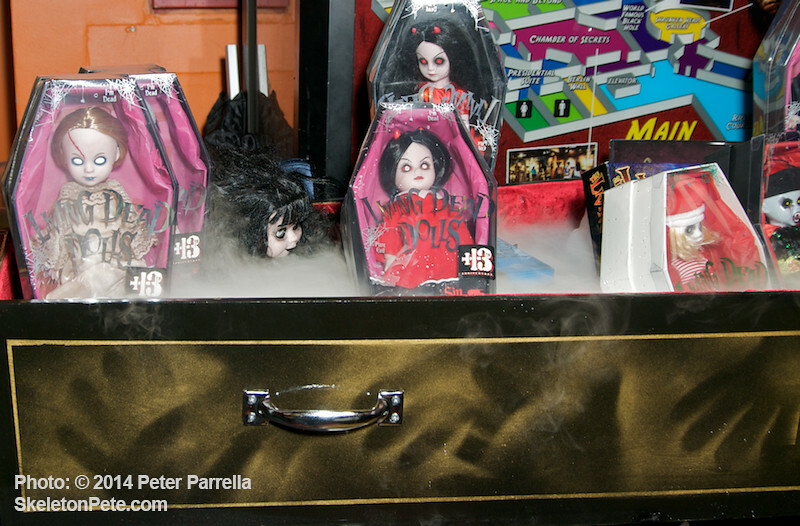 It’s a feat that earned the company special recognition at New York Toy Fair this past February for being the “longest continually produced series of collectible horror themed dolls” in the world. 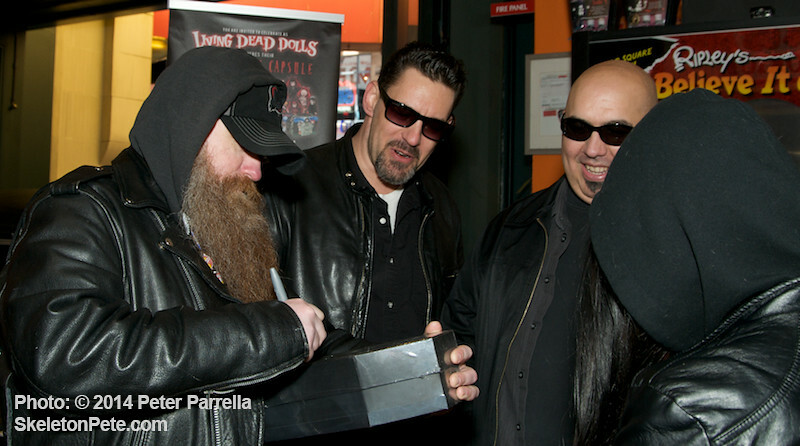 The casket will be loaded with series memorabilia including early production drawings, handmade and production dolls, mini figures, and more. 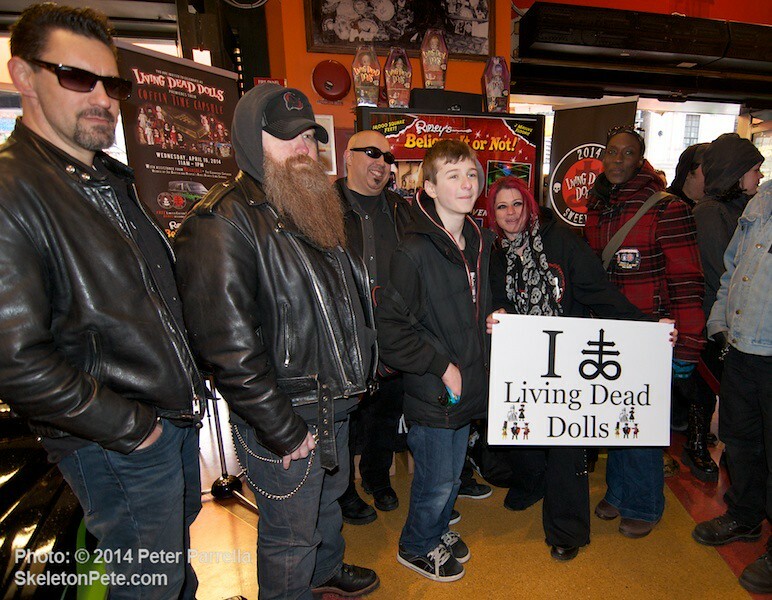 It will also house all of the “What Living Dead Dolls Mean To Me” videos recently created by fans for the year-long anniversary celebration. 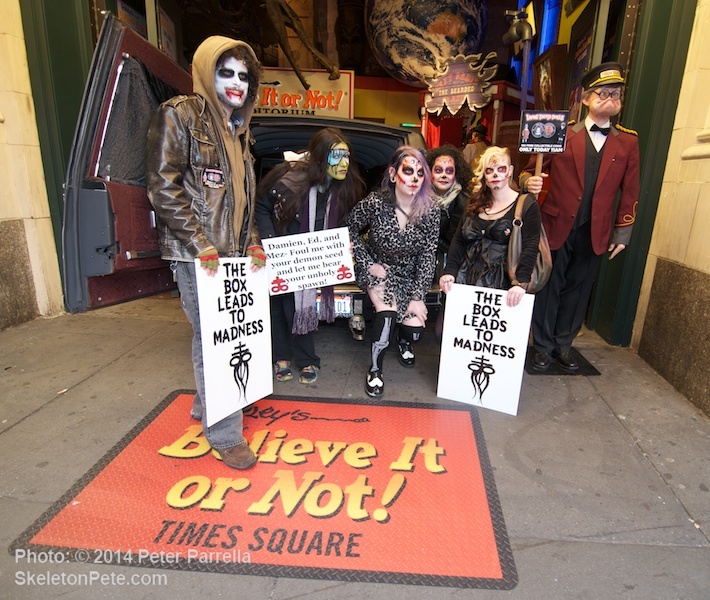 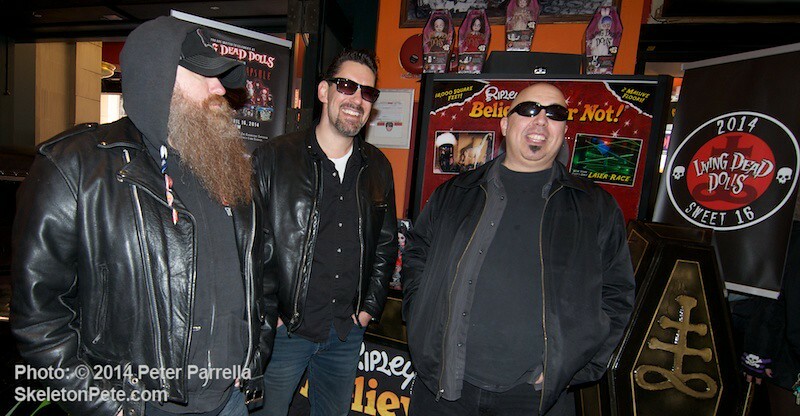 Hearsula Pulls Into Ripley’s Times Square Lobby to the Suprise of On-lookers. 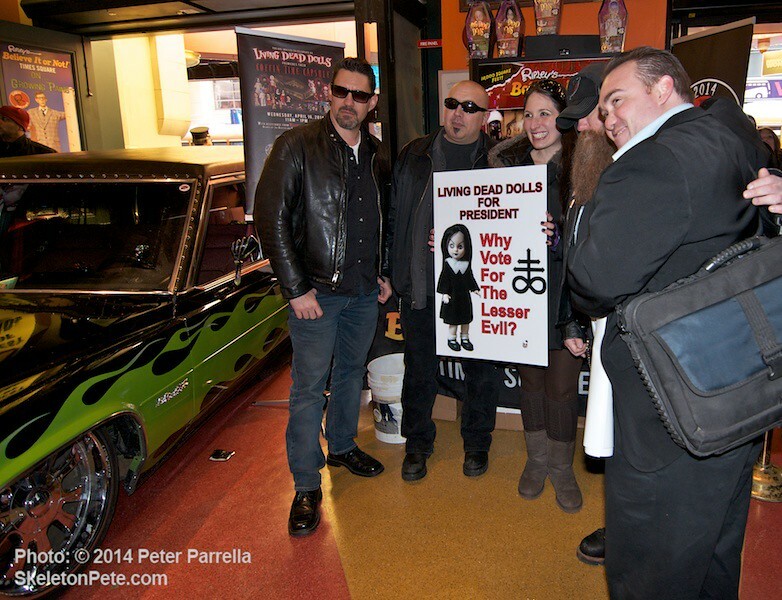 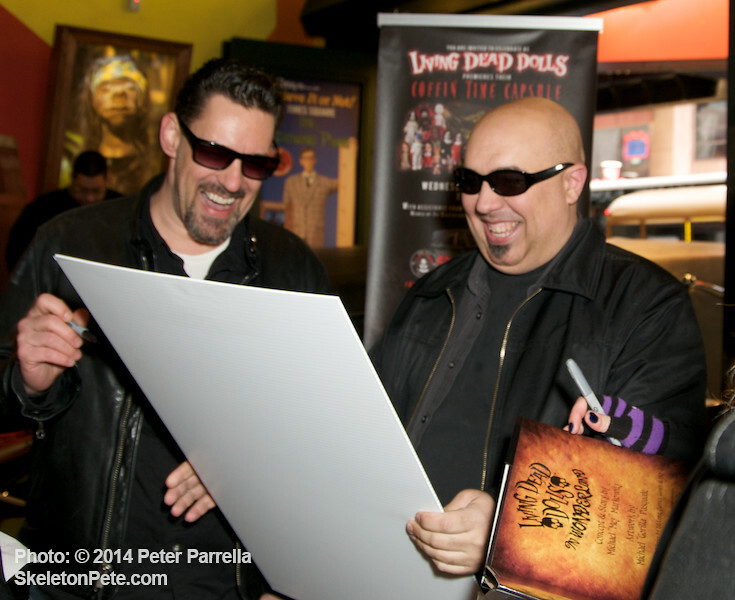 Ed, Mez and Damian Autographed Living Dead Dolls Collector’s Items for Fans. 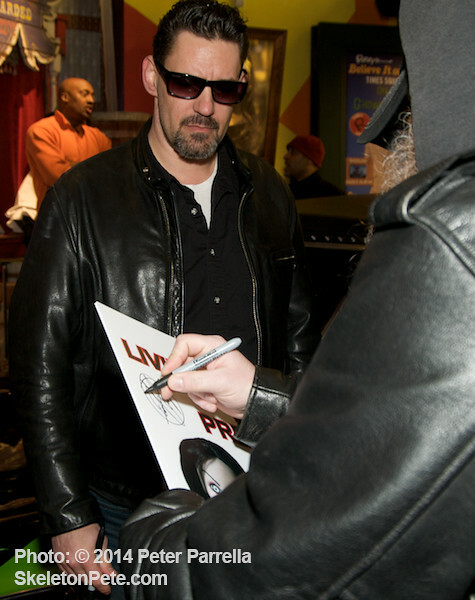 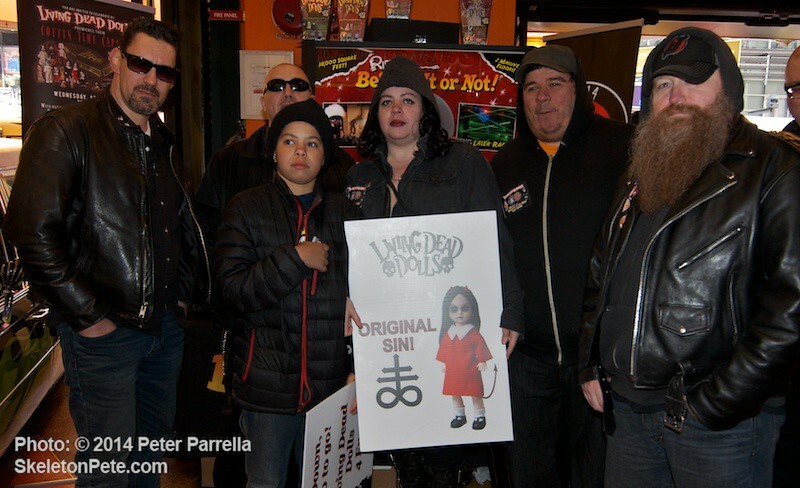 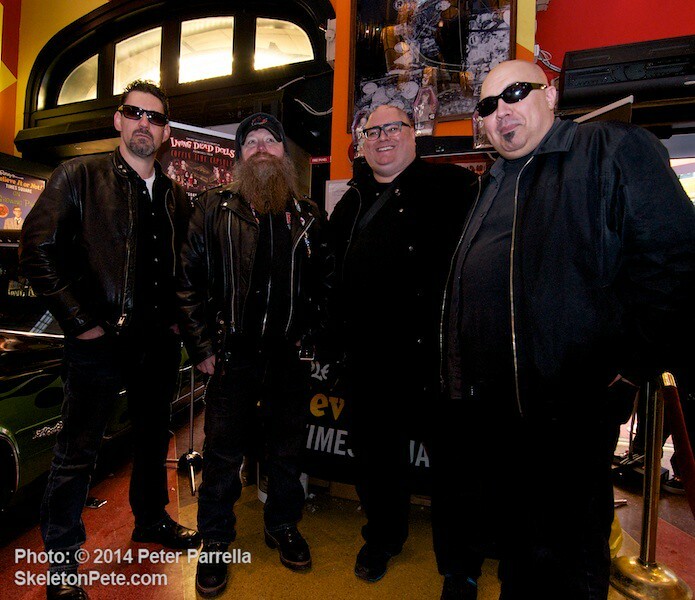 Series creators Mez, Damian and Ed were all on hand to meet fans, sign collector’s items, and play pall-bearers for the coffin which arrived on Times Square in the “Hearsula,” a tricked out Cadillac hearse. 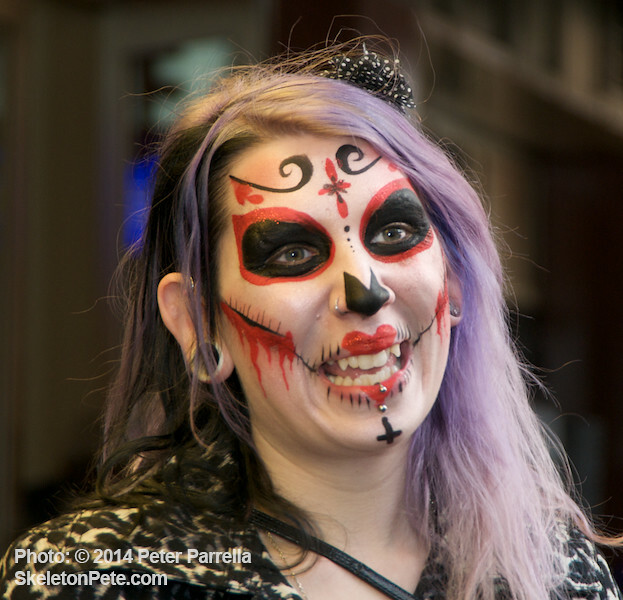 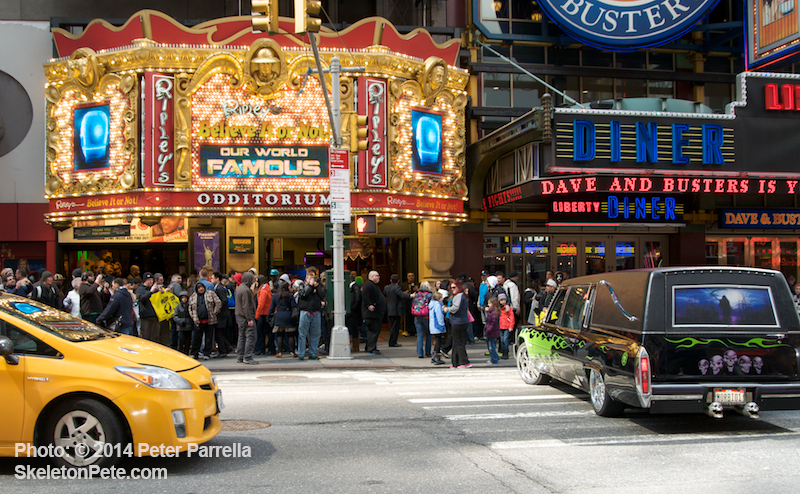 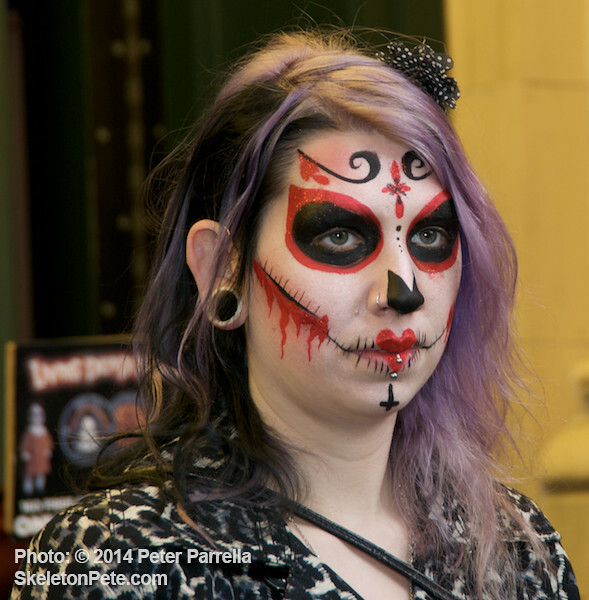 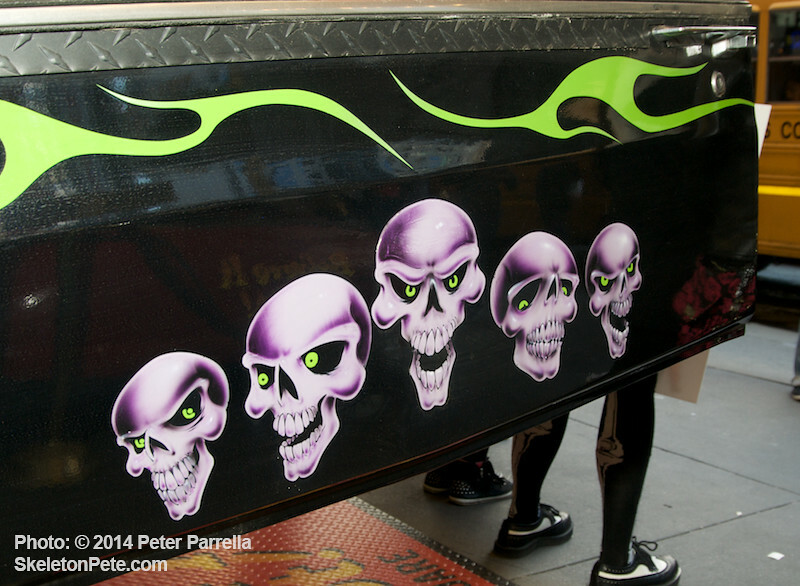 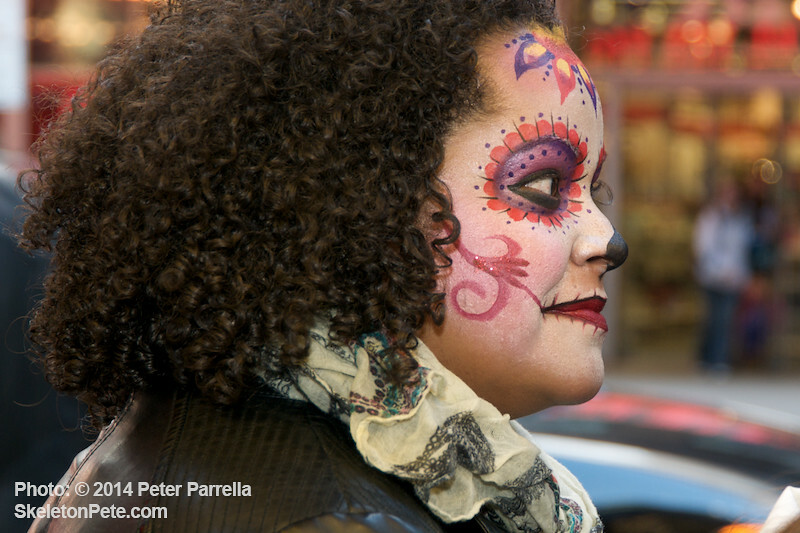 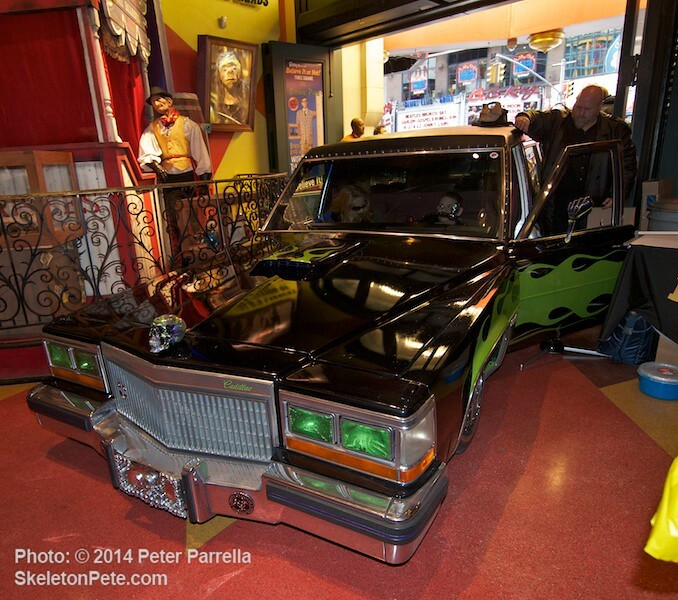 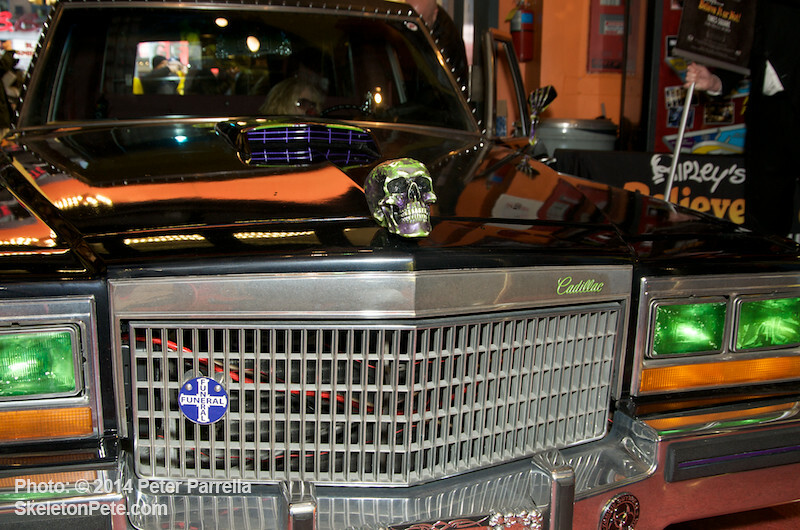 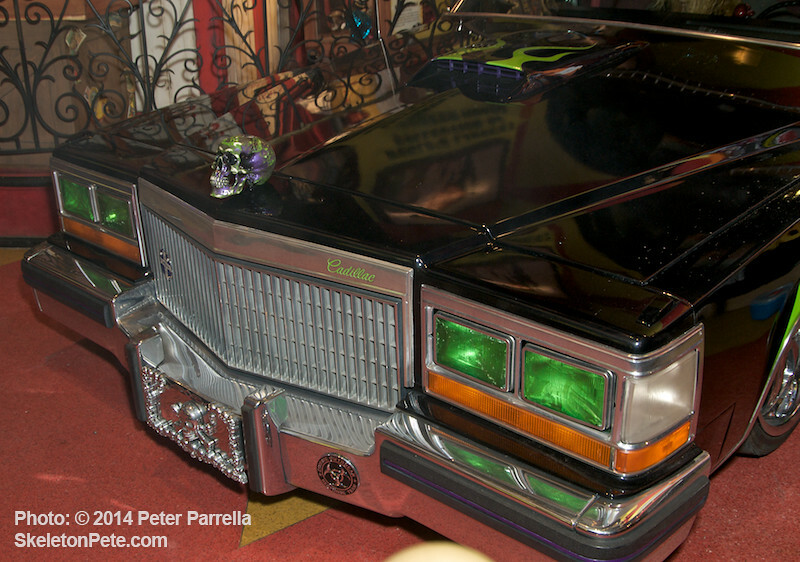 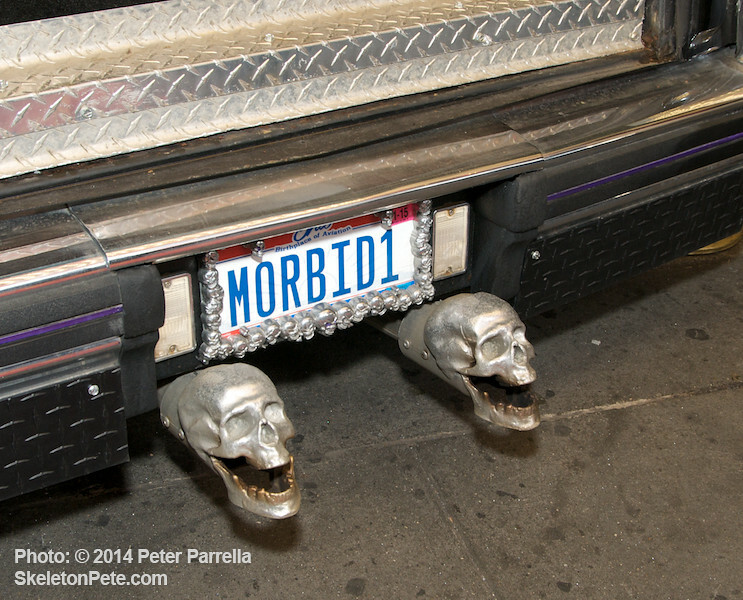 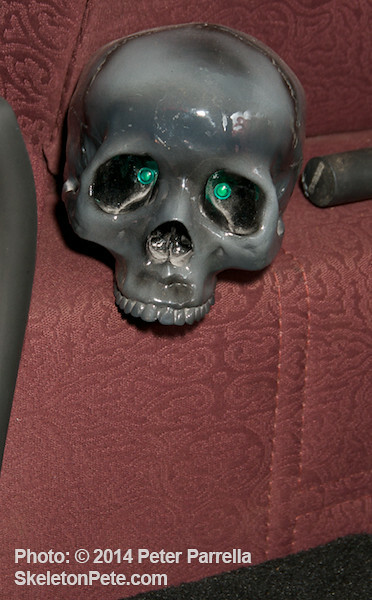 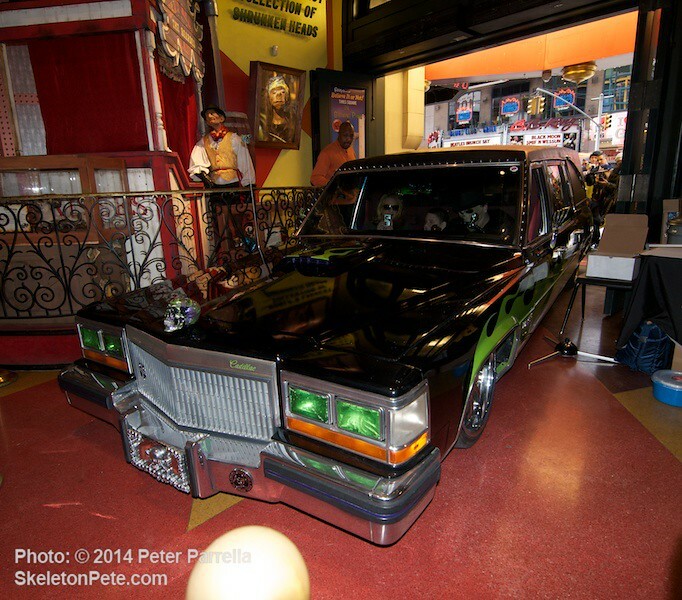 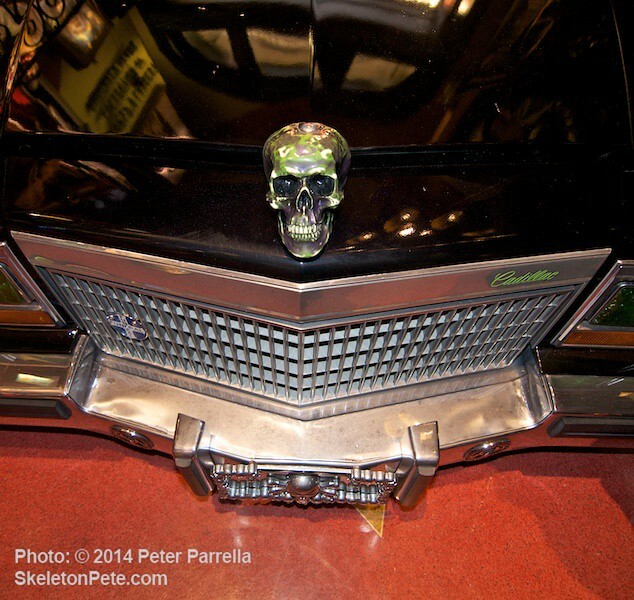 The skull adorned “Cadaveric Superior Hearse” by Joe Baxter and Reaper’s Rides Hearse Limo Service drew surprised stares from tourists and seasoned New Yorkers alike as it u-turned across 42nd street and pulled into the Ripley’s lobby. A lethal legion of gals and guys made up to resemble LDD’s invited unsuspecting passers-by to the event. 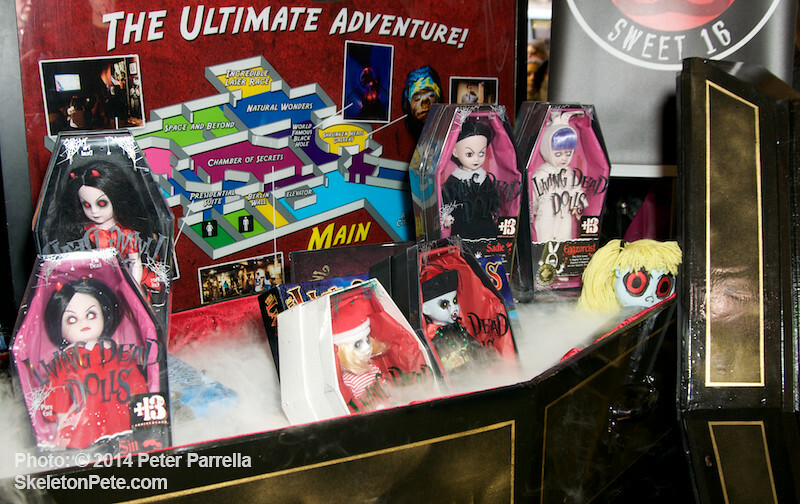 With the promotional panache of 1960’s film director William Castle (13 Ghosts, The Tingler) Mezco is earnestly and actively seeking an empty mausoleum chamber in New Jersey or New York for the Coffin Capsule’s resting place. 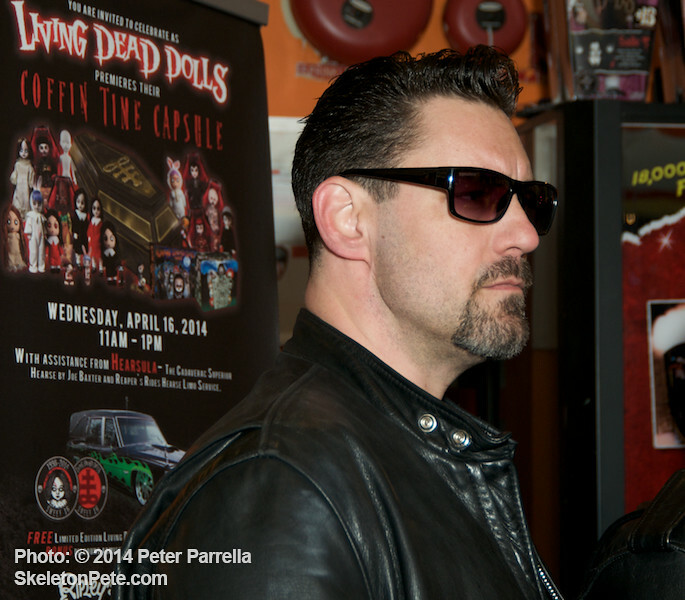 The intention is to revisit its content in 2064 when the Living Dead Doll franchise will reach its 66.6 birthday. 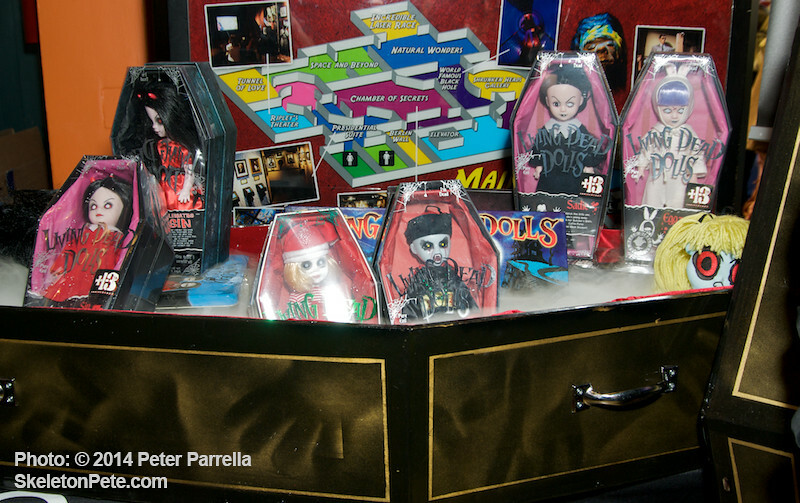 Any crypt owner with open space, who relishes the idea of sharing the long sleep entombed with these artifacts should contact Mezco at LivingDeadDollsCrypt@gmail.com with details. 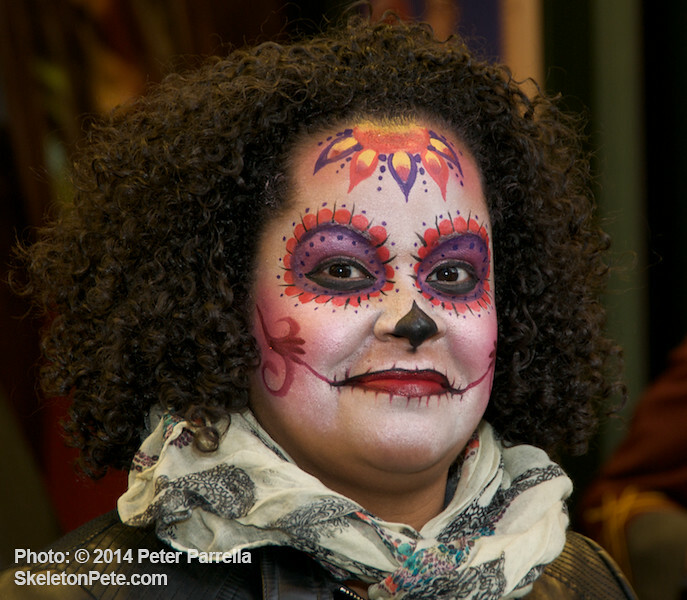 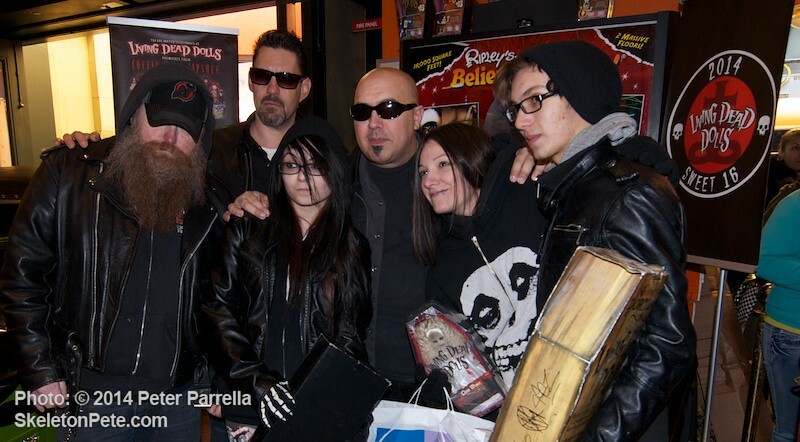 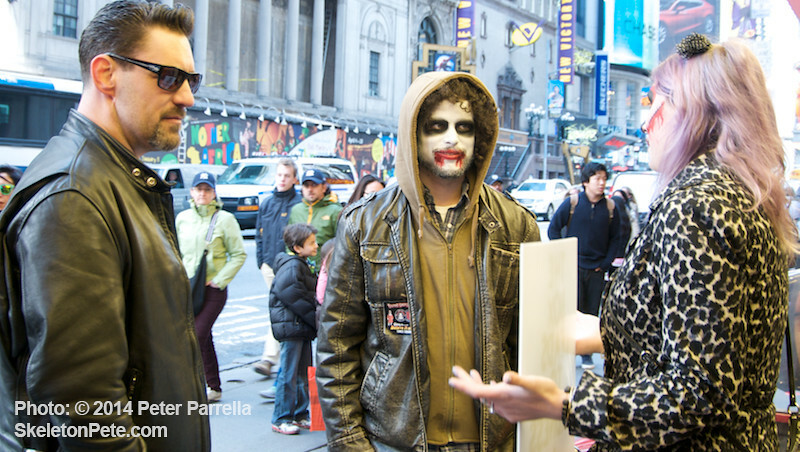 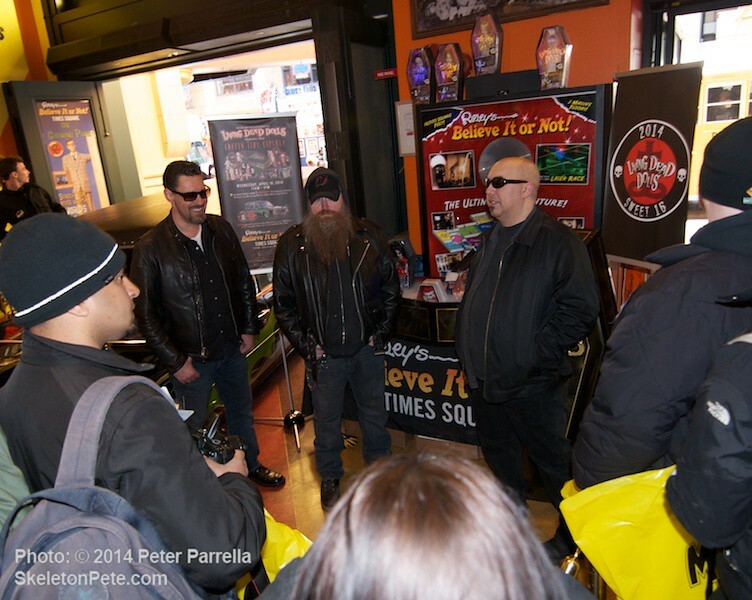 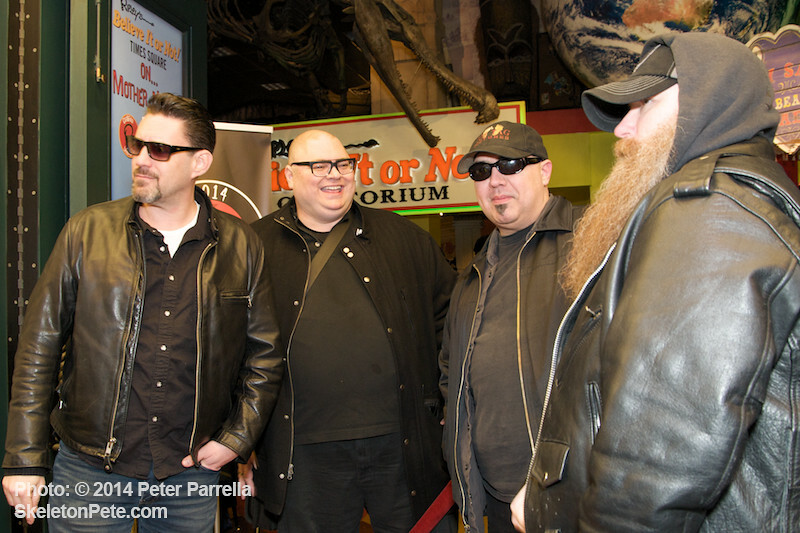 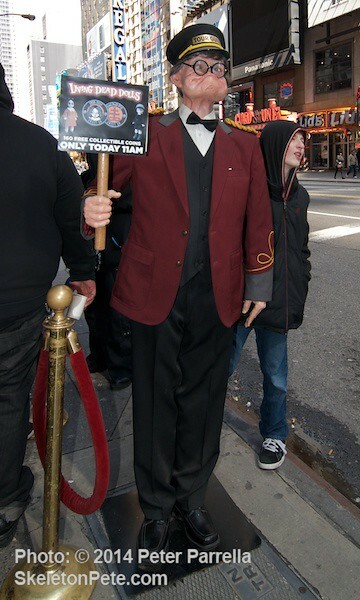 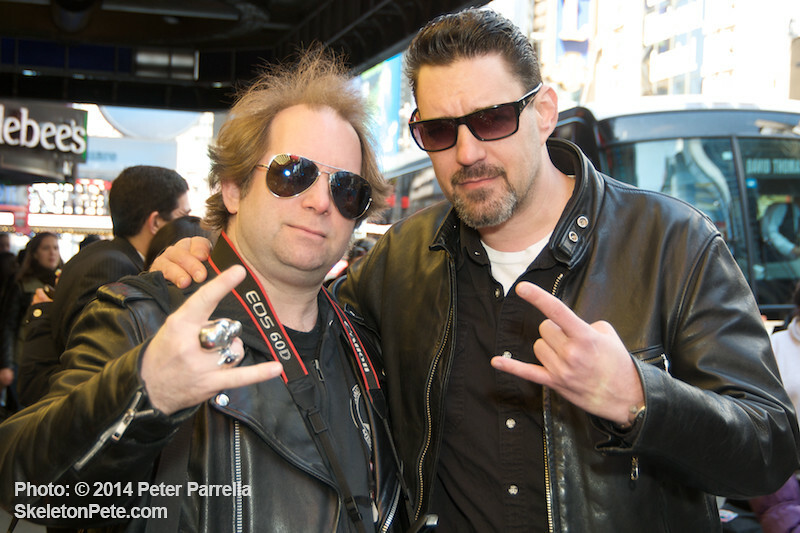 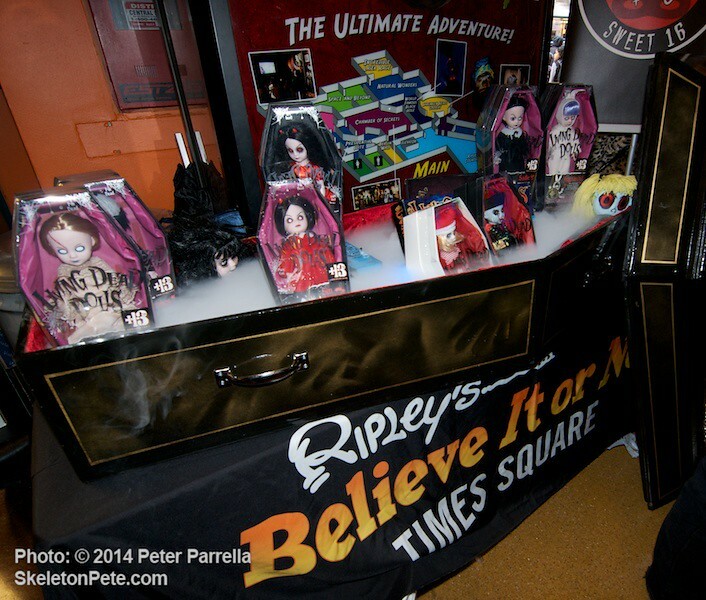 A Brood of Spirited Ghouls Welcomed Attendees to the Mezco/Ripley’s Times Square Event. 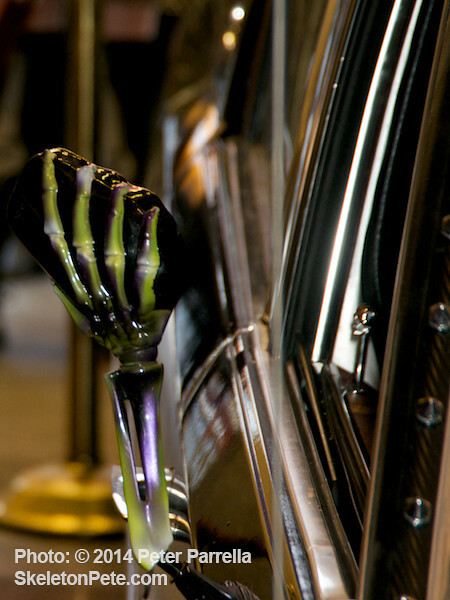 The folks at Mezco clearly appreciate all of their fans and Ripley’s tie-in events like this one and last year’s 1966 Batman & Batmobile appearance offer an excellent participation factor for the collector community. 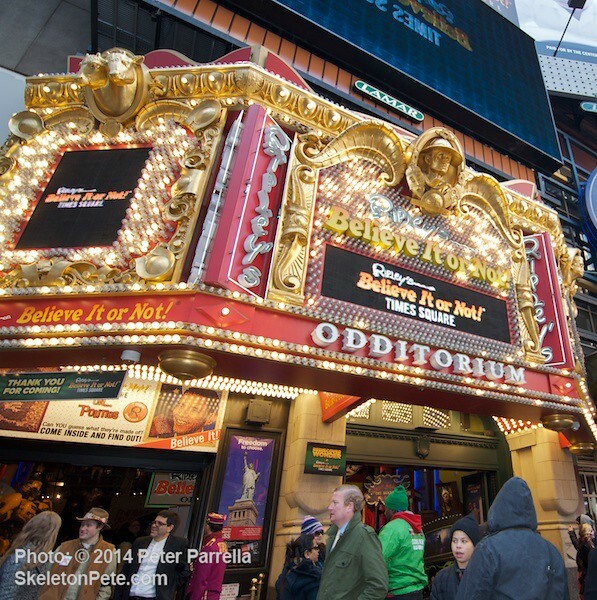 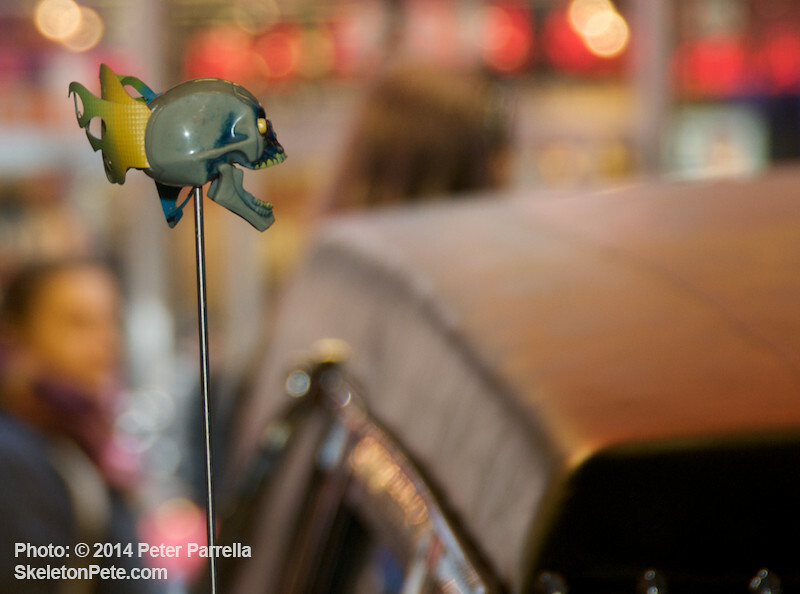 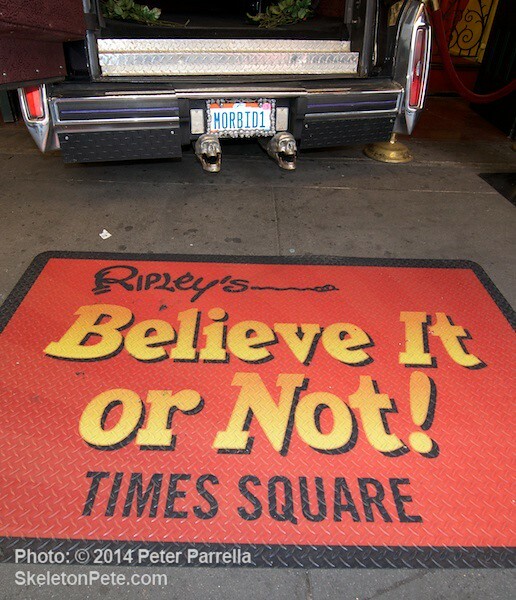 Stay tuned, there are plenty of things to explore at the Odditorium and I’ll be giving the Ripley’s Believe It Or Not Times Square a close-up look in the near future.